Presenting their ambitious intent Karbonn Mobiles have put forward their road map for the upcoming year 2014. The market share of domestic manufacturer has been steadily rising, thanks to the booming Indian smartphone market which now ranks third in the entire world. With this effort Karbonn anticipated the emerging digital trends in 2014 to work towards them and provide with competitive products at competitive price. 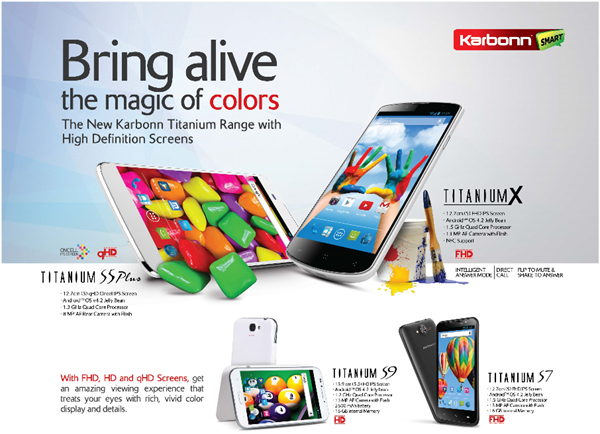 The Karbonn Mobile aims at hitting new benchmarks by providing what is in line with the emerging technology trends. The press release enlists the emerging global technology trends which Karbonn is considering. These trends include biometric technology like finger print scanner and eye scanner, faster WiFi, better Bluetooth, more processor cores, higher camera MP count, brighter displays, wearable technology and better software. Karbonn mobile’s roadmap for 2014 is not as candid but the speculative attempt indicate a company trying to keep up with the ever advancing tech trends, which is the key to survival in the fiercely competitive market and appreciated move for a relatively young brand launched in 2009.